Tuesday, Jan 29, 2019, 12:30 – 1:30 p.m. Dense, populous, dynamic, and vibrant are words often used to characterize the urban landscapes of Asian cities. The fluid matrix of social life, urban spaces, and transportation networks along with proximity of activities and services clearly distinguishes the major Asian cities from their North American counterparts. 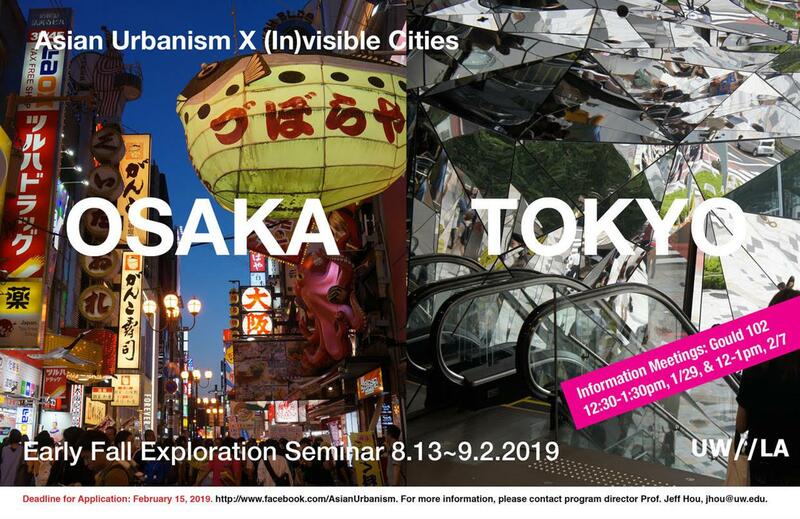 This traveling seminar will engage in a close-up examination of the urban landscapes of Osaka and Tokyo, two largest and most iconic cities in Japan. Through site visits and on-site exercises, students will explore both the everyday landscapes of Tokyo and Osaka and their iconic structures and spaces. This seminar will enable students to better understand how cities of East Asia support the everyday life of millions of residents and visitors; how they embody and reflect their distinct urban cultures and subcultures; and how they function as complex spatial systems. Questions? Please contact Jeff Hou — jhou@uw.edu.